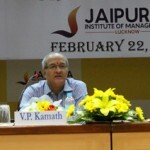 On 9th to 15th Feb: Jaipuria Institute of Management, Indore hosted its second annual fest recently amidst much fanfare. Jai Utsav was held from 9th to 15th Feb and brought together students from several B Schools in the city including Acropolis, IPS, Pioneer and PIMR. The organizers did everything possible to ensure that the student extravaganza was an event to remember and that’s just what it turned out to be. An air of healthy competition filled the venues and student camaraderie shone through during the week-long event. Mr. Saurabh Bhatnagar, Associate Vice President, Nai Duniya and Dr. J. P. Upadhyay, Director Jaipuria, Indore were present for the inauguration of the event along with faculty members and students from various institutes in the city. The event was graced by many eminent personalities including Mrs. Basmati Devi Upadhyay, Mrs. Mamta Upadhyay, Mrs. Usha Jain and Mr. Nishant Naik. As the anticipation at the venue kept building up, Dr. Priti Bakshi gave an address detailing the program for the event that included management games, sports and cultural activities. Mr. Saurabh Bhatnagar then declared the event open, which was followed by a cake cutting ceremony. It was then time for students to match their wits and prowess in different activities to make their respective institutes proud. And they all gathered for an inter-institute get together on the campus to begin the revelries on the first day. Business Challenge, Word War (Debate), Brandology (Brand Antakshari), Rajya Leela (Political Quiz), Silver Screen (Bollywood Quiz), Jo Dikhey So Bikey (Ad Mad Show), The Journalist and Business Simulation were some of the innovative and fun games that tested participants’ skills on Day 1. There was also a Presentation Competition and Salesmen of the Year contest that allowed future management professionals to display their talent. Play with Colours (Rangoli) and Kagaz Ki Kalakari activities added to the cultural element of the day. Fun-filled events meant for celebration of student spirit marked Day 2 of the event. Dramebaaz, The Portrait (Inter-collegiate Photography Competition), The Reel (Documentary), R J Hunt, Role Play, Bazm-e-Jaipuria (Kavi Sammelan), Dancing competition were some of the activities that spread cheer on the day. A mimicry competition filled the venue with laughter as participants imitated Bollywood artistes and created their own scripts, much to the amusement of the audience. A glamorous Fashion Show rounded up the day’s proceedings as students walked the ramp on the themes of Corporate, Traditional and Wild Life. “Innovating For India” was the overall theme of all the activities that were conducted throughout the event and the message was conveyed loud and clear. More than 350 students had attended the first two days of the extravaganza and they were brimming with more enthusiasm for the activities to follow over the next five days. The event, organized by students of Jaipuria, Indore under the guidance of its Director and faculty members was shaping up to be a huge success. Winners of different competitions went home with trophies and prizes that they will cherish for a long time to come. But looking at the smiles on all participants’ faces, it was obvious that this was an event where everyone was a winner. 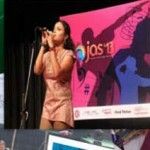 Jaipuria Lucknow to host Ojas 14, which promises to be a stunning extravaganza.